Many Neopians abuse proper grooming for their neopet. Well, I'm here to help! Most grooming items work great with all species, and this article will walk you through all the Dos and Don'ts. Many items are wonderful for those on Budgets and you can still make sure your neopet has the best grooming around for all those contests, special occasions, or just every day! NOW, I will take you through every cleansing grooming item for your neopet, from Soaps, Shampoos, Conditioners, Towels, Combs, Brushes, Toothpaste, Toothbrushes, Lotions, and Hair Clips. When you first see this soap, you will think, "Oooh. That's so pretty. I bet it smells nice." Well, it smells AWFUL! Unless you want your neopet smelling like a bag of frozen peas, I would stay away from this stinky soap. Yes, this soap smells very nice, but it's more like a candle. It doesn't get very bubbly and the wonderful scent doesn't stick to your neopet, but instead creates an unpleasant smell and sticky look. This soap bubbles nicely, leaving a very nice scent to your neopet. It also leaves a shiny, moisturized look to your neopet's skin. This soap barely has a scent; however, it's very cool and refreshing. Very recommended, as your neopet will feel relaxed, clean, and refreshed after using it. It cleanses and moisturizes wonderfully! Plain. No scent, leaves fur frizzy and unappealing. It lets fur get dirtier faster, and it only gives a light dusting of a cleansing. However, it seems to work well with petpets. Really, this Shampoo seems to be scented water. Possibly, it could just be scented rain water. Water doesn't do much to cleanse, so this shampoo isn't suggested. It seems to let fur get dirtier a lot easier as well. This shampoo lives up to its name by leaving fur super shiny and refreshed. It's thick and bubbles nicely, working well for thick fur for neopets like Cybunnies, Gnorbus, Wockies, etc. It also smells nice and leaves your neopet's fur scented fresh. A bit more expensive, but worth it. It's a thick, creamy shampoo that smells of Scented Hearts Flower, a very, very pleasing smell that will leave your neopet smelling fresh and clean for days. Also soothes frizzies and leaves fur shiny, silky, and sleek. It simply doesn't work. Your neopet's fur won't be any different than if you didn't use this conditioner, except it will leave a bad scent behind. It's no wonder this conditioner is so cheap! It works well with any shampoo, leaving a nice scent behind that doesn't disguise the smell of the shampoo. It's thick and creamy, soothing all your neopet's frizzies and knots. This towel is rough and scratchy. When toweling down your neopet, it can leave your neopet's skin irritated and scratch it up. Don't ruin a perfect soap and conditioning job by using it. This towel is soft and flexible. It's very plush and absorbent as well, soaking up all the dripping water from your neopet's fur. And it will also look very cute hanging on your bathroom wall! This comb isn't very flexible or strong and is bound to break when combing through thick fur. And for thinner fur, it seems to separate the hair and leave unwanted marks. It has a thick, stiff shape, but sometimes being flexible is all for the better. It doesn't do anything for thin fur, and for thick fur it seems just to get stuck and knot it up even more. It does cost a bit more, but it works well with thin and thick fur. It's flexible, yet strong, so it can get through those knots easily. This comb can also work nicely just for neatening fur. It's flexible and it has thin-tip bristles, which work very well for thin fur, and it's great for neatening thick fur. Just try not to burn yourself, or your neopet! 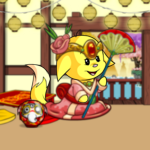 It doesn't seem to do anything except slide on your neopet's fur. The bristles are too soft and kept together to get much done. It doesn't even work well on thin furs. Oddly enough, all the other glittery brushes seem to work fine. I'm not exactly sure why it's only this one that doesn't work well. The bristles seem to be itchy and can irritate your neopet's skin. They scratch right through thick and thin fur, brushing right onto the skin. The spaced-out bristles work well for getting rid of the tangles and knots in thick hair. This brush even works great with thin fur, neatening it and gliding it together. It's not JUST for Unis, but in fact works well with all species with fur. Neatens and brushes right through thin and thick fur, yet the bristles are so soft that it won't irritate the skin underneath. This toothpaste doesn't do much to clean teeth. It also tastes bad. Oh, and how can I forget, it will leave your neopet's mouth full of glitter! That's unhealthy. Your basic toothpaste. It tastes good, cleans well, and your neopet's breath will smell very fresh. Your neopet will have a winning smile after continuously using this toothpaste. Your neopet will never again skip brushing their teeth! This tasty toothpaste is so yummy, it's a challenge not to swallow it! It leaves breath smelling fresh, and it will leave your neopet's teeth nice and pearly white. This one's pretty self-explanatory. It's old and dirty, and you never know who's mouth was on it before... yuck. It's also very expensive. The Deluxe brushes are very bulky and difficult to get in the back of some neopets' mouths. The bristles on these brushes can also be a bit tough on your neopet's gums. The bristles are soft on the gums and rough on the teeth. When used with the right toothpaste, this toothbrush will give your neopet and amazing smile. It's not too big either, making it compatible with all species. This brush has a good amount of soft bristles, and yet a good, thick, not too big stick. Brushing can get done quickly and easily with this toothbrush. It's got a bit of an unappealing smell. It's also quite greasy. It will rest on top of your neopet's skin and leak right off of their fur, making them feel dirty. It doesn't do much moisturizing, either. This Lotion smells nice, but it's sticky and attracts petpetpets. When mixed with sweat, your neopet will feel very oily and dirty, and it only moisturizes well when not mixed with sweat. A very nice, luxurious scent. It sinks right into your neopet's skin and moisturizes well. The glitter melts right off, yet the lotion will stay firm on the pet's skin, assuring no dirty, greasy feelings. On top of all, this lotion makes skin extra soft. It also has a lovely fragrance, and it sticks to your neopet's skin, making sure it won't become oily or greasy. This hair clip looks a bit silly, and it digs into the skin. 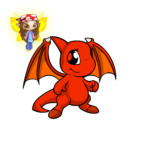 Fur seems to fall out of the clip fairly easily while your neopet is moving around. A very nice clip that will keep your neopet happy; however, the giant baby Aisha head on the side makes pets look quite ridiculous. Fine if your pet just wants it to sit at home, but you never know when you would need one out in public. A very nice, simple clip. Your neopet will look just fine in it and it parts away fur without pulling it or irritating skin. This clip is absolutely beautiful. Your neopet will love how it easily keeps fur clipped up, but even more how pretty (oooh, and shiny!) it is. It's also pretty hard to bend or break. Well, there you have it. Some lovely grooming items your neopet would enjoy being groomed with, and others to completely avoid. There are plenty of other grooming items, so, if you want to, go ahead and try them out! I was about to smile nervously, when I suddenly remembered my goal, and turned it into a scowl. "Arr... what ye all be doin' now?"